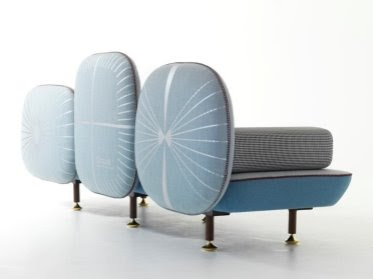 My beautiful backside by designers Nipa Doshi and Jonathan Levien ... not bad for a modest $14.325 . I love the materials used: wool and felt. My Beautiful Backside is a collection of seats whose backrests are a composition of highly coloured, floating cushions in various shapes. The wider your seat, the more cushions you can have. Our use of oversize symbols, such as the buttons on cushion backs, is a way of conveying a variety of messages. These symbols also provide a means of customising each chair, making it unique, just as you would add little distinguishing touches to an article of clothing. We used a new wool fabric designed by Giulio Ridolfo for Kvadrat. We teamed it up with felt because it's a combination that reminds us of old-fashioned clothes with stiff starched collars. 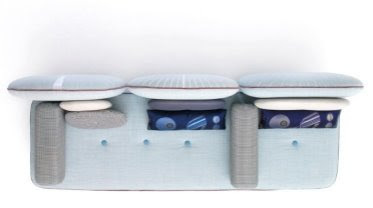 We also designed a new daybed, called Princess, with layers of mattresses. The top mattress is covered with a composition of different objects and since they draw inspiration from a modern princess they're embroidered in gold and silver.